Depending on how you created your Native Module, you can either download it or check it out from a Git repository. If you created your module before ApiOmat version 2.1.0, or if you created a "Native Module via JAR" (as described here), then you need to download the module. If you created a "Native Module via Git" (as described here), then you need to check the module out. The provided Ant script can be used to update ones SDK in one step. 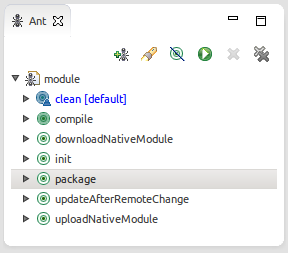 The build.xml file can be opened in Eclipse using the "Ant" view. The tasks uploadNativeModule and downloadNativeModule can afterwards be executed by double-clicking the respective entry. All further tasks (init, clean, compile) handle subtasks and will be executed automatically. For checking out the new module you just have to clone the Git repository, or pull the changes if you already cloned it before. 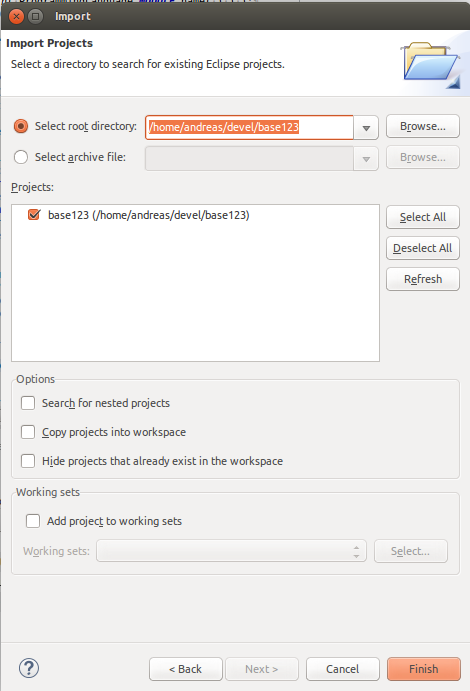 After the content of the downloaded ZIP archive has been extracted into a folder, or a git repository was chcked out, that directory can be imported into Eclipse as a Java project (File -> Import -> Existing Projects into Workspace).